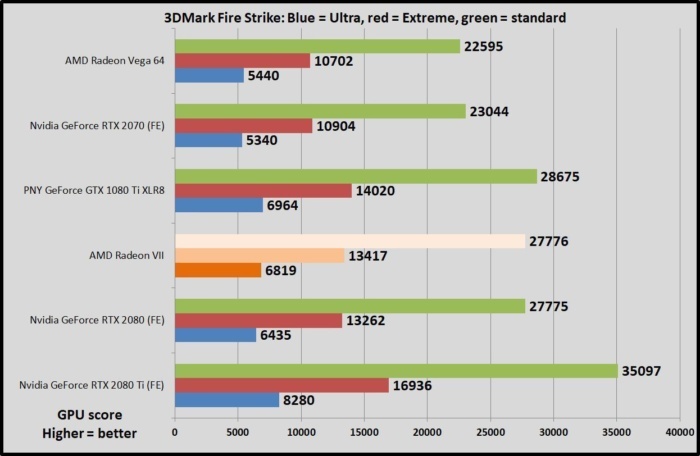 We also tested Radeon VII using 3DMark’s highly respected Fire Strike synthetic benchmark. Fire Strike runs at 1080p, Fire Strike Extreme runs at 1440p, and Fire Strike Ultra runs at 4K resolution. All render the same scene, but with more intense graphical effects as you move up the scale, so that Extreme and Ultra flavors stress GPUs even more. We record the graphics score to eliminate variance from the CPU. Yep, everything falls about where you’d expect after observing the gaming benchmarks, which is always the case with Fire Strike. It’s a good “sanity check” tool. We test power draw by looping the F1 2018 benchmark for about 20 minutes after we’ve benchmarked everything else, and noting the highest reading on our Watts Up Pro meter. The initial part of the race, where all competing cars are onscreen simultaneously, tends to be the most demanding portion. 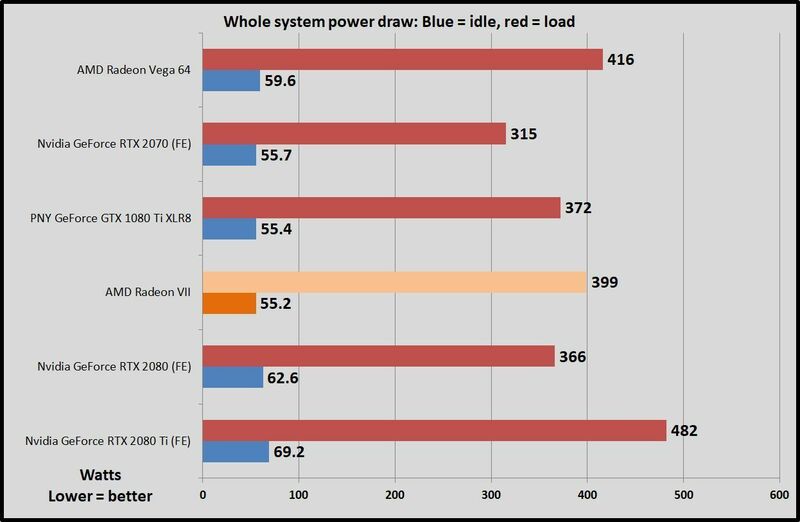 Moving to the 7nm process has done wonders for Vega’s power efficiency. 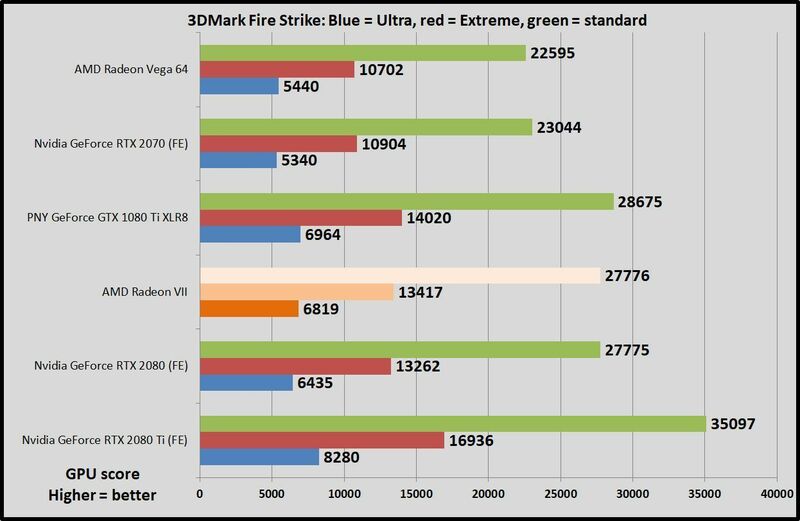 It’s still not quite on a par with Nvidia’s results, but it’s a close enough that efficiency can’t be considered an AMD drawback anymore. It’s a colossal improvement over the hot, hungry Vega 64. We typically test thermals by leaving HWInfo’s sensor monitoring tool open during the F1 2018 5-lap power draw test, noting the highest maximum temperature at the end. 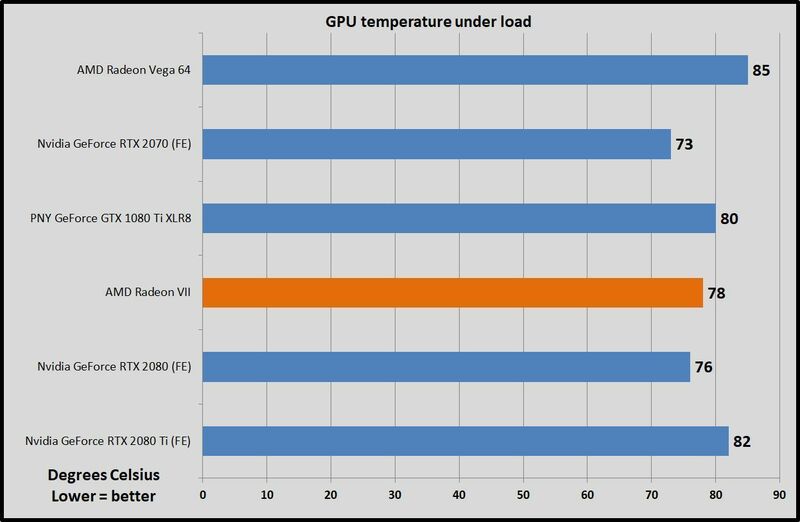 But third-party monitoring software like HWInfo and SpeedFan haven’t been adjusted to handle the way AMD tweaked Radeon VII’s temperature monitoring, and display the newer (and much higher) Junction Temperature rather than the traditional GPU temperature reading. Because all other graphics cards list the GPU temperature, we need to test that to properly compare performance. 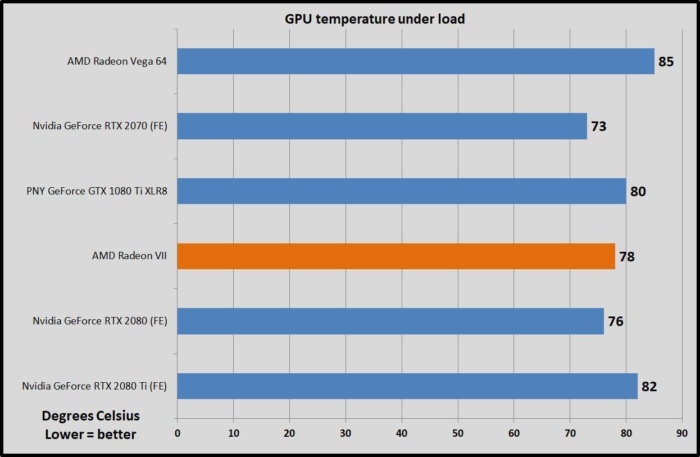 As such, we deviated from using HWInfo on the Radeon VII and measured the GPU temperature using AMD’s Wattman tool instead. 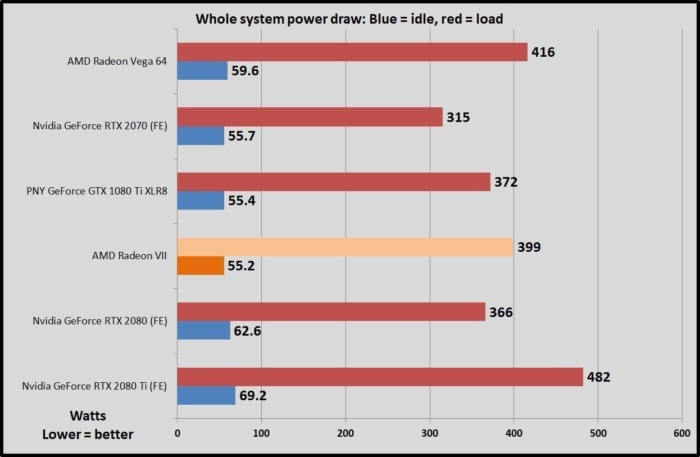 Assuming Wattman’s readings are accurate—and they’ve always tracked with HWInfo and SpeedFan in the past—then Radeon VII once again crushes its hot-blooded predecessor, Vega 64. Topping out at 78 degrees Celsius (172.4 degrees Fahrenheit) under load, AMD’s fan-laden 7nm GPU runs at a perfectly acceptable temperature. Heck, it’s chillier than the PNY GTX 1080 Ti’s customized cooler. No complaints here. You can definitely hear the Radeon VII working when it’s under full load, but not enough to be distracting. Once again, it’s a huge improvement over the Vega 64’s banshee-like screaming. 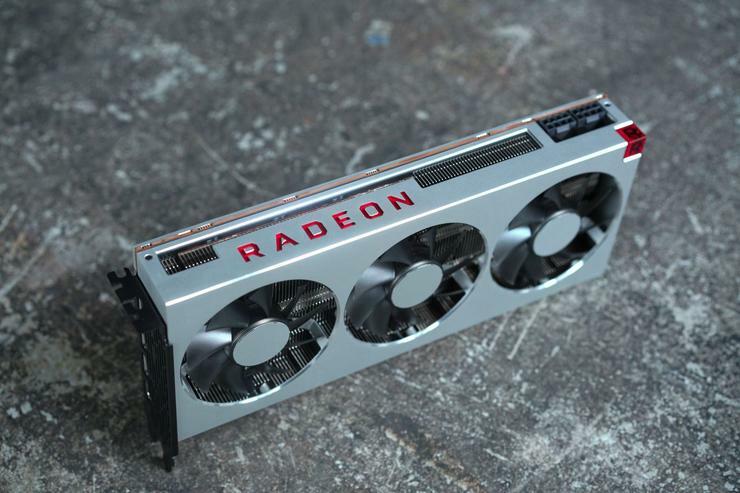 Next page: Should you buy the AMD Radeon VII?